Editor’s Introduction: In this week’s Magic Oddica the author shares some rarities that reveal a precursor to the double-sided cards in Innistrad block. Check out Chapter XI of Keith Adams‘ Magic Oddica to learn all about these unique collectibles! In the fall of 2011 Wizards of the Coast announced a new, revolutionary type of concept for their Magic cards; this time we are going to make cards that have a front on both sides! Players and collectors alike were divided on their thoughts but only a few of us were pointing out something. This double front concept is not something new. What is new about it is that this is the first time they intentionally released cards like these. There are some in-house printings, and there are also cards that were mistakenly printed and released into packs. The ones most similar to the Innistrad concept are commons from Weatherlight. At least one full sheet of commons, about 120 cards, accidentally made their way into packs. In each case, we have a different common printed on both sides. Also, each side is miscut differently. Side A is shifted downward, and side B is miscut to the left and down (see scans below for a better representation). While I’m a bit lukewarm on the idea of the new Innistrad concept, I feel it is important to note the concept is an old one. 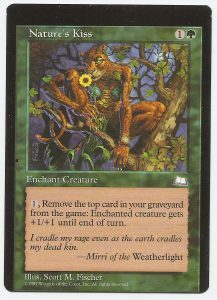 I showed these Weatherlight cards to Richard Garfield in 2005, plus no doubt someone had thought of this long beforehand. They must have been hesitant to try this concept in the first place, but they finally found a good reason to go ahead with it. As for these misprints, so far I have seen about one dozen of them, but have not come across any lately. So far, I have yet to see any duplicates, and given how they are cut I can tell the difference between the sides. These apply to Weatherlight commons only. Most Weatherlight commons don’t see much play any longer, but Mind Stone and Empyrial Armor come to mind as the more popular choices. Unfortunately, since these cards are meant to have a traditional backing, they are not tournament legal. As always, I have provided a video showing a few examples of these cards. These cards are the exact reason why I wanted to do videos in the first place. Anyone can scan two fronts and claim these cards exist, but here is the video proof – Innistrad was old news before it was released.